This composite of the spiral galaxy NGC 6872 combines visible light images from the European Southern Observatory's Very Large Telescope with far-ultraviolet data from NASA's GALEX and infrared data acquired by NASA's Spitzer Space Telescope. The spiral is 522,000 light-years across from armtip to armtip, which makes NGC 6872 about 5 times the size of the Milky Way. Astronomers have crowned the universe's largest known spiral galaxy, a spectacular behemoth five times bigger than our own Milky Way. The title-holder is now NGC 6872, a barred spiral found 212 million light-years away in the southern constellation Pavo, researchers announced today (Jan. 10). The distance between NGC 6872's two huge spiral arms is 522,000 light-years, compared to about 100,000 light-years for the Milky Way. NGC 6872 has ranked among the largest known spiral galaxies for decades. But it has only now been crowned champion, after detailed study of data gathered by a number of instruments, including NASA's Galaxy Evolution Explorer spacecraft, or GALEX. Eufrasio presented the results today at the 221st meeting of the American Astronomical Society in Long Beach, Calif. He stressed that spirals bigger than NGC 6872 may be out there, still waiting to be spotted and studied in depth. NCG 6872's enormous size and odd appearance are the consequence of its gravitational interaction with a neighbor galaxy called IC 4970, which contains just 20 percent of NGC 6872's mass, researchers said. Computer simulations suggest that IC 4970 made its closest approach about 130 million years ago, stirring up a burst of activity in certain parts of NCG 6872. "The northeastern arm of NGC 6872 is the most disturbed and is rippling with star formation, but at its far end, visible only in the ultraviolet, is an object that appears to be a tidal dwarf galaxy similar to those seen in other interacting systems," Duilia de Mello, a professor of astronomy at Catholic University, said in a statement. 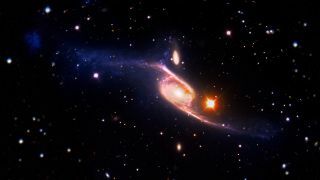 NGC 6872's bar, which links the galaxy's arms and its central regions, is also huge. With a radius of 26,000 light-years, it's about twice as big as the bars of nearby spirals, researchers said. No evidence of recent star formation is apparent in NGC 6872's bar, suggesting that it formed several billion years ago or more. The $150 million GALEX mission launched in April 2003 to study the history of star formation in the universe. NASA stopped funding the mission in February 2011, and in May 2012 it handed the spacecraft's reins over to the California Institute of Technology, which is keeping the mission going with private funds.